Is Cagle trustworthy after leaked recording takes shots at owners of guns and big trucks? Georgia gubernatorial candidate Brian Kemp shakes hands with Sandra Campbell and Adrienne Mauldin at the Burr Performing Arts Park Monday, July 9, 2018 in Dalton, Georgia. The forum which was hosted by the Whitfield County Republican Party fell just 15 days before the runoff election in Georgia. 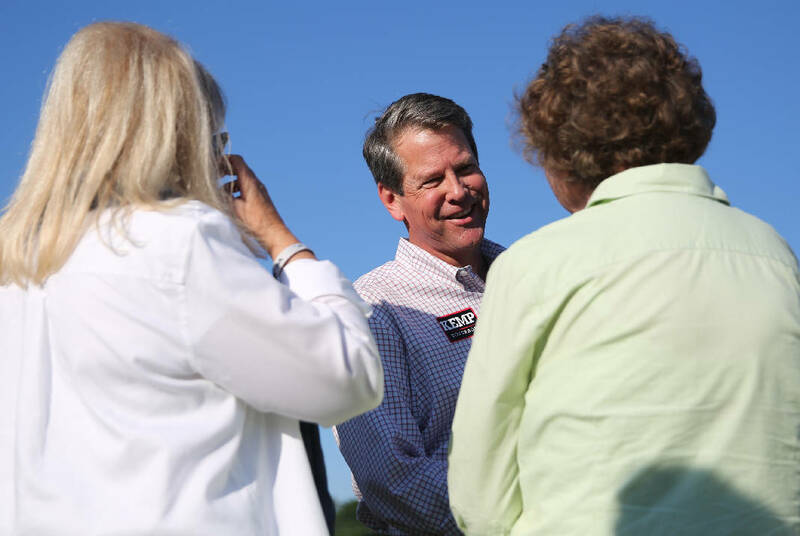 DALTON, Ga. — After another secret recording leaked, Georgia governor candidate Brian Kemp was confident that a significant number of Republicans have abandoned his opponent. "People have lost trust in [Lt. Gov. Casey Cagle] because they know he will put politics ahead of policy and put campaign donations ahead of policy, even if it's during the legislative session," Kemp said Monday evening, during an event hosted by the Whitfield County Republican Party. On Wednesday morning, Kemp's campaign leaked a 50-second snippet of a conversation between Cagle and Clay Tippins, who unsuccessfully ran against both men in the May 22 Republican primary. The conversation took place May 24, when Cagle sought Tippins' endorsement. The portion that Kemp's campaign leaked begins with Cagle telling Tippins that they have the same opinion about a particular issue. It's not clear what issue he's talking about. "The problem is, in a primary — and you and I are just talking off the record frank — they don't give a [expletive] about those things," Cagle said. "OK? In a general election, they care about it. OK? But they don't care about it in a primary. This primary felt like, it was, 'Who had the biggest gun? Who had the biggest truck?' You know? And, 'Who can be the craziest?' Right? That's what it felt like." "Casey talked policy," Brinkley said in a statement. "Kemp talked crazy. And yes, Casey Cagle called Brian Kemp out on it. Share the transcript. PLEASE. We have nothing to hide." "If he thinks I'm being bombastic because of commercials that show guns and big trucks and a chainsaw that wants to cut government regulations," Kemp told the Times Free Press on Monday, "he's right there with Hillary Clinton, calling everybody deplorables." During the May 22 Republican primary, featuring five candidates, Cagle finished first with 39 percent of 607,441 votes — about 60,000 votes shy of the outright majority necessary to avoid a runoff. Instead, he will face Kemp, Georgia's secretary of state, who received 25.5 percent of the vote. In the Northwest Georgia counties of Catoosa, Chattooga, Dade, Gordon, Murray, Walker and Whitfield, Cagle's performance was about in line with the rest of the state. He got 38.6 percent in this area. Kemp, meanwhile, underperformed, getting only 18.9 percent here. But Kemp said Wednesday he believes he closed the gap between himself and Cagle. First, supporters of Tippins and Hunter Hill are backing him now, he said. Also, he thinks he's gained "momentum." A big part of that momentum? The recordings of the May 24 conversation between Cagle and Tippins. In a previous snippet, which leaked last month, Cagle told Tippins he pushed through a bill that increased tax credits for Georgia residents who donate to private schools for political reasons. About three weeks later, Cygnal, an Alabama-based national research firm, conducted phone surveys with 812 likely Republican primary voters. It showed a neck-and-neck race between the candidates: Cagle had 44 percent of decided voters, and Kemp had 43 percent. In turn, state Sen. Renee Unterman, R-Buford, said Kemp should be under criminal investigation because of his relationship with the owner of Massage Envy. Kemp received campaign contributions from the owner. Meanwhile, at least four complaints have been logged against the company's therapists for allegedly grouping women. Thus far, the Board of Massage Therapy has not sanctioned or revoked any of the accused therapists. Unterman wrote U.S. Attorney B.J. Pak, saying there "appears to be a direct connection between campaign support from Massage Envy franchisees in exchange for non-action and suppression." On Monday, Kemp said there is no merit to Unterman's accusation. He said his office investigates claims in these cases, but ultimately the board decides whether to punish a therapist. He said the governor appoints the board members, and he believes the investigation is still open. "Once we do the investigation, I have no power to control the sanction," he said. "That is a regulatory responsibility, by law, of the licensing board. Renee Unterman is either playing politics, or she doesn't understand how the process works." Kemp spoke during a "Meet the Candidates" event sponsored by the Whitfield County Republican Party. Dianne Putnam, the party's chairwoman, said they also invited Cagle, but he could not attend because of another event on his calendar.